Nebraska is back on the road for some Friday night lights action in Champaign against Illinois. We are just one more week before one of the biggest recruiting events in recent memory for Wisconsin week. Before we get to the game, there is plenty of recruiting news and buzz to discuss. As always, I’ll take you through what I know, who is visiting and where Nebraska stands with the next crop of Huskers. In the immortal words of Bane from "The Dark Knight Rises," let the games begin. >> Nebraska had a productive weekend last week with their official visitors. >> The Huskers offered a big time in-state prospect and Mike Riley extended the offer himself. >> I took a look at just who Nebraska could be targeting at the quarterback position to flip for the 2018 class. Since it’s an away game there are no visitors to discuss so lets get right to the scoop! >> After publishing my piece on quarterbacks that could be flipped, I got a DM from North Carolina QB commit Tyler Shough. It was his birthday on Thursday and he told me that Nebraska has not been in contact with him at all since his commitment to UNC. >> We know that the Wisconsin game is building up to be the biggest recruiting event of the Mike Riley era with perhaps double digit official visitors on the sidelines. The list is still coming together and is always fluid but there is a lot of talk that 4-star running back TJ Pledger (an Oklahoma commit) could be joining Brendan Radley-Hiles on the trip. >> I am also hearing that Nebraska is working on getting 4-star ATH and No. 2 Greg’s Guy Talanoa Hufanga on campus for the game. Nebraska is in his top six and he has stated multiple times that the Huskers will get a visit. >> There has been a lot of talk around Florida 4-star quarterback commit Matt Corral. He is close with Bookie, teammates with 4-star WR Jalen Hall and 4-star DB Aashari Crosswell and has taken all of his Gators commit information off his social media. Plus the program he is committed to has a lot of turmoil surrounding it. If all of this sounds familiar, it’s because it sounds very similar to the things swirling around Bookie. There is a key difference here though is there seems to be steam picking up behind the scenes for recruits to band together and help Mike Riley. We will see how it plays out with Corral in particular but Nebraska did have interest in the California gunslinger in the summer when he decommitted from USC. Corral is a very influential recruit and it would make significant waves if Nebraska can land a visit from him. If Corral is trying to recruit Bookie to Florida, you can bet Bookie is getting him to look at Nebraska. >> When I tell people that the damage that would be done to this recruiting class and beyond would be catastrophic this is one of the reasons why. There are several high-profile recruits both committed and still being targeted that feel a great connection to Mike Riley. Not to mention the high school coaches, 7-on-7 coaches and parents who helped ignite the Calibraska movement. That’s a big deal that I’m sure the administration is aware of. 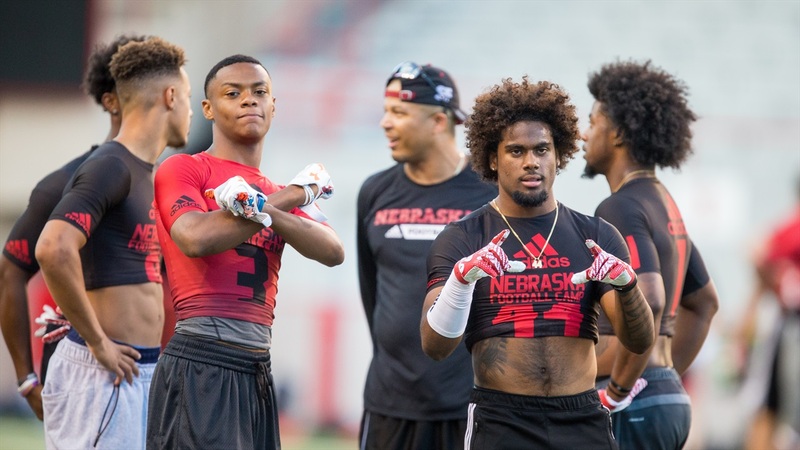 >> I spoke with 3-star safety Dallas Craddieth on Thursday and he told me that the Nebraska staff will be at his game on Saturday after their game on Friday against Illinois. The hard-hitting safety attends Hazelwood Central in Missouri and it’s not far from Champaign. In fact, he will be attending the game as a visitor for Illinois.